In 2010, I predicted that Auburn would go 11-0 in the regular season with a toss-up against Alabama. Auburn went 12-0 in the regular season. In 2011, I predicted that Auburn would go 9-2 in the regular season with a toss-up against Alabama. Auburn went 7-5 in the regular season. So what does that mean? It means that I should not and will not predict an Auburn loss ever again. You gonna argue with me? I’m 18-4 over the last two seasons. Seriously, though, I really like this schedule. All the tough ones at home (besides the Iron Bowl) gives Auburn a decent shot to win them all. Here’s how I think it will go as of right now, before we’ve seen a snap of football. Sept. 1 – Clemson (Georgia Dome) – Kiehl Frazier will show the world why he was such a highly sought after recruit as Clemson returns to their rightful place in the land of overhype and ACC football. Worry level: 8. Score: Auburn 31, Clemson 23. Sept. 8 – at Mississippi State – The cowbells won’t ring quite as loud at 11 am, but will be enough to make this one a slight defensive battle. Worry level: 5. Score: Auburn 21, Mississippi State 14. Sept. 15 – UL-Monroe – The first home game of the season will bring some extra excitement to an otherwise boring opponent. Worry level: 1. Score: Auburn 41, UL-Monroe 10. Sept. 22 – LSU – LSU’s first road game and first tough opponent (no, Washington is not tough) will be more than Mettenberger will be able to handle. Worry level: 9. Score: Auburn 17, LSU 14. Oct. 6 – Arkansas – A normally high worry level took a back seat when Jessica sat on the back seat of Petrino’s hog, but the passing game will still be scary. Worry level: 7. Score: Auburn 35, Arkansas 31. Oct. 13 – at Ole Miss – Just because Auburn should dominate Ole Miss, they probably won’t, as the Rebel Black Bears hold on until the Auburn running game takes over in the 4th. Worry level: 3. Score: Auburn 34, Ole Miss 17. Oct. 20 – at Vanderbilt – Vanderbilt could be 1-5 at this point, or they could have a few upsets under their belt, but they won’t beat Auburn in Nashville this time. Worry level: 5. Score: Auburn 27, Vanderbilt 13. Oct. 27 – Texas A&M – The Aggies’ first trip to Jordan-Hare won’t be a good one, as the Tigers start to take back the series (currently 0-2). Worry level: 6. Score: Auburn 38, Texas A&M 21. Nov. 3 – New Mexico State – More Aggies come to the Plains and leave with with their… whatever Aggies can put between their legs. Worry level: 1. Score: Auburn 45, New Mexico State 7. Nov. 10 – Georgia – Aaron Murray sees Nick Fairley on the side of the stadium, goes into shock, and the backup takes a beating. Worry level: 8. Score: Auburn 28, Georgia 24. Nov. 17 – Alabama A&M – I wonder if they’ll let me play quarterback in the 2nd half. Worry level: 0. Score: Auburn 52, Alabama A&M 0. Nov. 24 – at Alabama – I don’t know why I’m always so worried about Auburn playing in Tuscaloosa given the lopsided record. Now call me a Barner homer. Bring it. All very reasonable predictions. I too ALWAYS worry about the TURDS in TURDville even though it is JHWest. This is why I had to stop playing bowl pick ’em. I just couldn’t pick Auburn to lose. You know, people are gearing up for college football… I bet they’d LOVE some high-rez versions of NCAA 13 for the xbox and ps3… If only someone could post them… haha. WDE. I might be able to do that but it wouldnt be any time soon. Great idea though. I love this preview! Just the right amount of homer-ism. Every game is a worry level of 10 to me. College Football Rules the Land in the South” by By BRETT MICHAEL DYKES, it was in Aug 25 edition. Frightening about UAT and surprising that LSU isn’t more rapid. 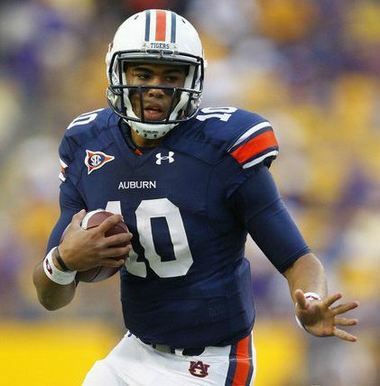 We play the underdog so well…keeping the games close will bring success throughout this year…WAR EAGLE!!! !